Artist Series: Adams is proud to present the Artist Series xylophone, the result of more than two years of research and development. The wide, non-graduated, hand selected Honduran Rosewood Bars speak clearly, quickly, and fully,recalling the caracter of vintage American instruments. 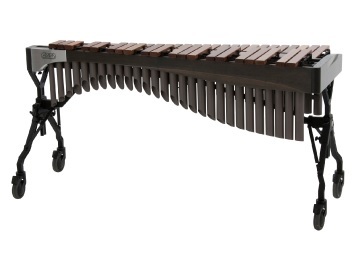 The xylophone’s precisely crafted bar geometry gives the instrument not only its voice, but also an effortless playing experience. The gorgeous, nickel plated steel resonators help project the brilliance of the keyboard to the back of any hall. All of these innovations, coupled with the standard Adams Voyager frame, noise free welded resonators, and computer assisted tuning method, make an instrument remarkable enough to bear the Adams Artist Series name. Alpha Artist xylophone: At first sight, the visual energy of Alpha Series captures your attention – the design’s flowing lines and uninterrupted curves draw you towards the instrument. After playing the keyboard for a few moments, the advances made possible by the new Alpha tuning method are apparent – the open, resonant, and full sound of the instrument sets a new benchmark for quality. The Alpha xylophone’s wide Honduras Rosewood bars effortlessly fill the concert hall.